Alas for concussion recovery, I had to abstain from alcohol consumption. The drink pairing looked very interesting as I glanced at what other diners were having. 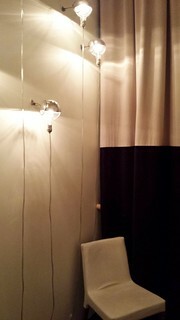 A bottle of sparkling mineral water was all that I could handle. 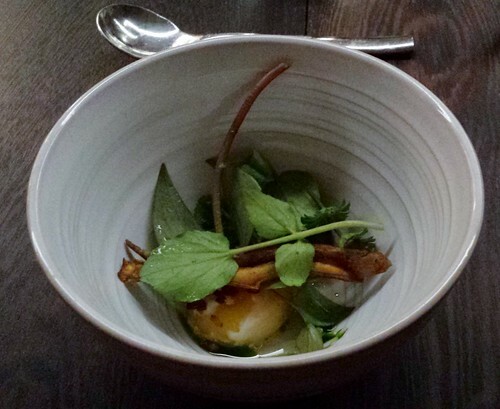 The menu began with wild nettles, crispy potato skin, poached egg. The chef suggested that I dress the salad with the yolk. It’s been ages since I last had wild nettles. It was exciting to have a taste of spring even though everything is still grey and brown back home. 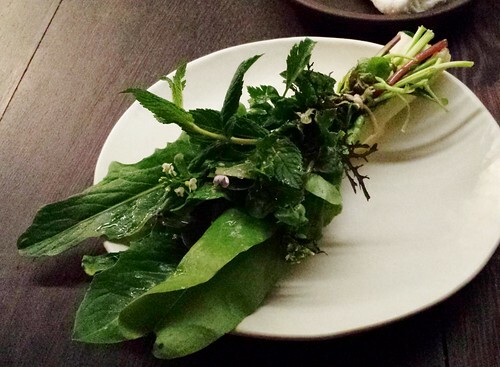 Chef Moran’s heavy emphasis on foraging and using local ingredients immediately made its mark. Next a warm hand towel was brought to me and it kicked off a trio of dishes to be enjoyed free of cutleries. First up was Alaskan red shrimp 2 ways: rosemary torched mousse, raw wrapped with fermented kohlrabi. 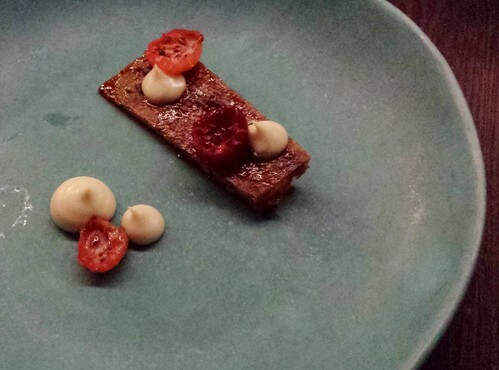 The torched shrimp head was filled with tomalley mousse with the smoky taste of torched rosemary. There is no elegant way to describe it: I sucked its brain out. The raw half of the shrimp was wrapped in fermented kohlrabi giving the sweet flesh a bit of briny bite. Next up was crisped braised pork tail, Jerusalem artichoke puree, roasted gooseberries. I did not know that pork tail is such a meaty cut. On one side, the braised meat remained tender and juicy. On the other side, it was caramelized until crispy. The contrast of texture was most excellent along with creamy puree and tart berries. I can eat a lot of this. The third dish was a bouquet of bitter greens with cashew butter huckleberry dressing, pine vinegar, candied pecans. At first I was a little dismay at the potential messiness. But a closer look at the construction of the salad bouquet and I understood. A sturdy rib at the bottom supported more delicate greens on top. The dressing was carefully injected between the leaves so the salad was well dressed without drips. The candied pecans nestled carefully yet securely close to the bottom. I actually munched up the whole bouquet without dropping anything on the plate. 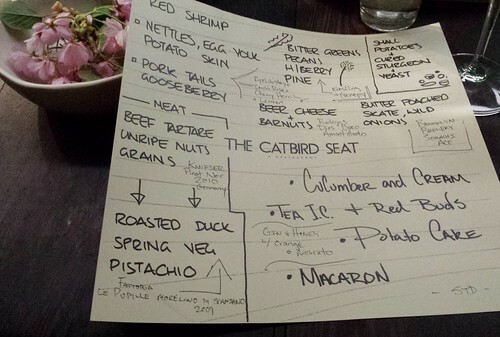 It was a whimsical presentation without sacrificing on taste. The kitchen knows how to cook fish. 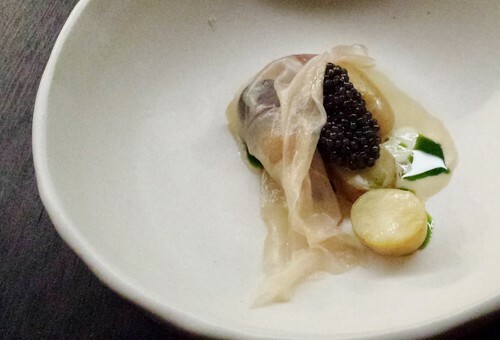 Small potatoes, cured sturgeon, caviar, lovage, crème fraiche, yeast broth took advantage of the savoury taste of cured sturgeon and caviar to infuse the humble potatoes with flavour. It was at once luxurious and comforting. 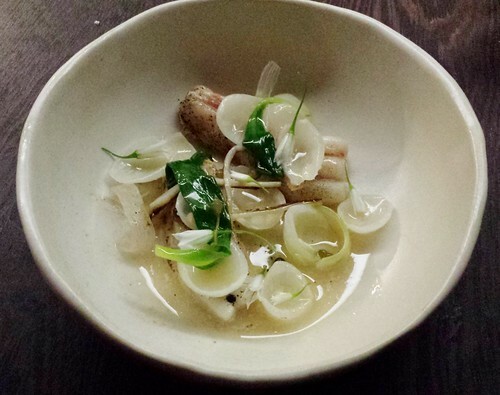 Butter poached skate wing, wild spring onion, ramps, onion flower, pickled capers, dashi just crossed the line from raw to cooked. The buttery skate wing was highlighted by the assortment of allium which reminded me of classic Cantonese ginger scallion steamed fish. I can never say no to a good plate of beef tartare. 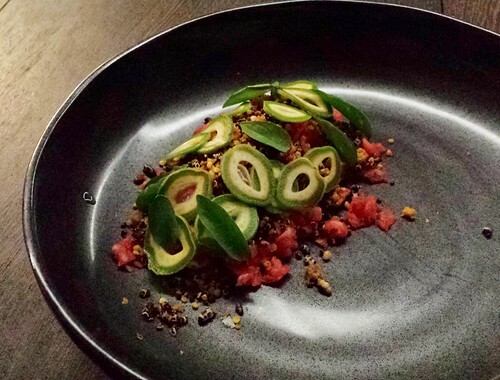 Here I had 45 days dry aged beef striploin tartare, toasted grains, green almond, peanut leaves, yogurt. 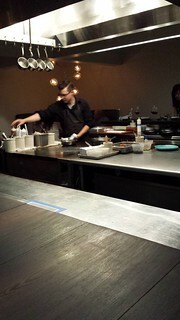 The beef was grinded in front of us minutes before serving. Unfortunately, I am not a fan of the texture from grinding. I much prefer hand chopped. Chef Moran departed from the classic garnish of raw egg and capers. I absolutely loved the crunchy nutty grains. It was my first time eating peanut leaves. At first it tasted like most salad greens but slowly the hint of peanut flavour came through. It paired really well with the fresh green almonds, creamy yogurt, and rich beef tartare. What an excellent and novel combination! 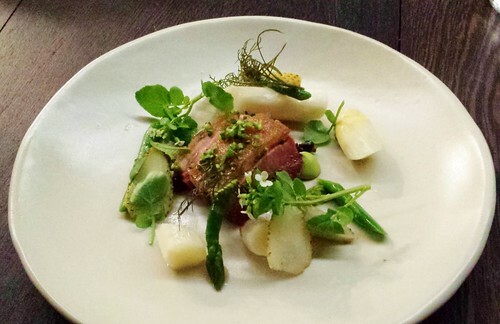 Roasted duck, pistachios, green and white asparagus, watercress, green strawberries was an ode to spring and all things green. The meat was cooked to exactly medium rare. The fattiness lifted by the confetti of spring greens. My favourite was green strawberries. Who would have thought the tart berries pair so well in a savoury dish? The cheese course was nothing that I would have imagined. 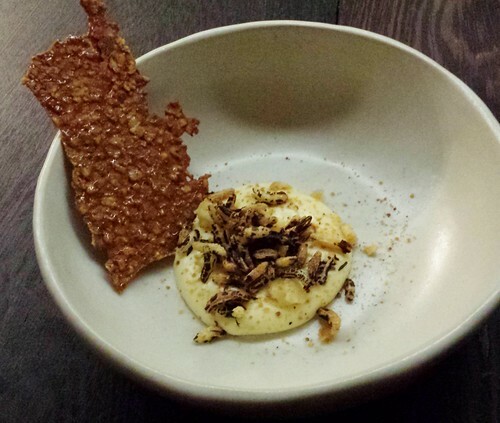 Beer cheese made with raclette and PBR, puffed wild rice, fried onion, mustard salt, barnut crisp was a fun take on pub classic. The warm espuma tasted like a lightened version of beer cheese. I greedily scooped up every last bit with the salty sweet barnut crisp. The intermezzo of whipped cream, cucumber snow, cucumbers, cucumber blossom, candied Meyer lemon did exactly what it was meant to do. 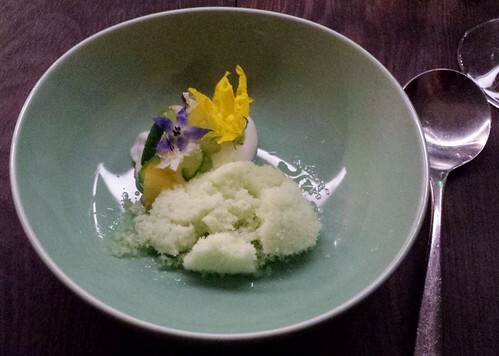 The palate cleansing cucumber snow was spooned onto the plate at the last minute. My favourite component was the candied Meyer lemon. I expected it to be like marmalade but instead it was a combination of lightly sweet, tart, and floral. 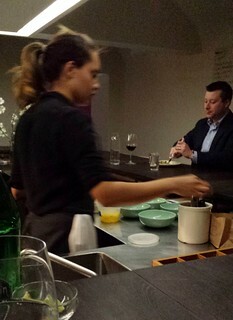 I am not easily impressed by dessert courses but The Catbird Seat left a strong impression. Oolong tea ice cream, Tennessee red buds, vanilla bean, salt was simple but sublime. 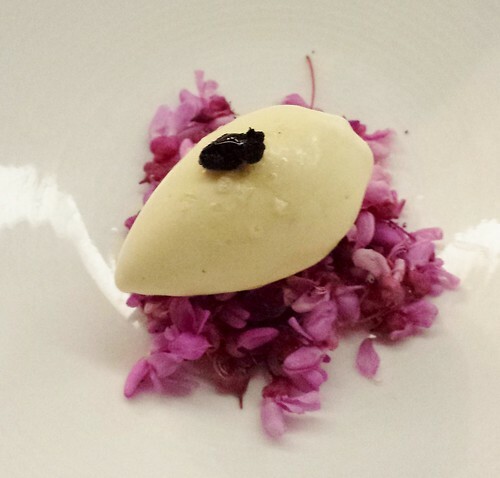 The edible flowers echoed the floral notes in the ice cream and vanilla beans were expectedly intoxicating. But it was the salt that really made the dish. It put every taste into focus and inspired me to experiment more with using salt in dessert. 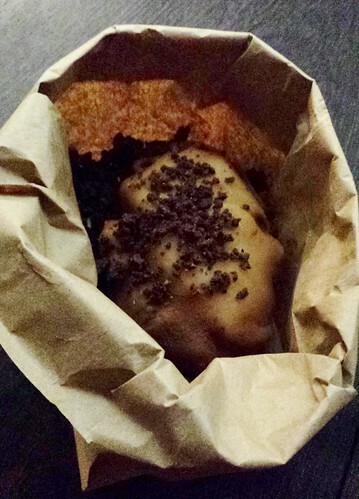 Danish potato cake: choux pastry, cream, sweet potato, marzipan, cookie crumb, tonka bean was another highlight. 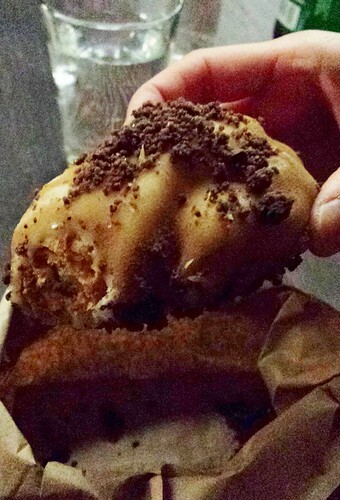 This traditional Danish pastry reflects the time chef Moran spent in Copenhagen. Imagine an éclair wrapped with a thin sheet of marzipan and you get the idea. I wanted to immediately run home and make my own (and I will very soon). 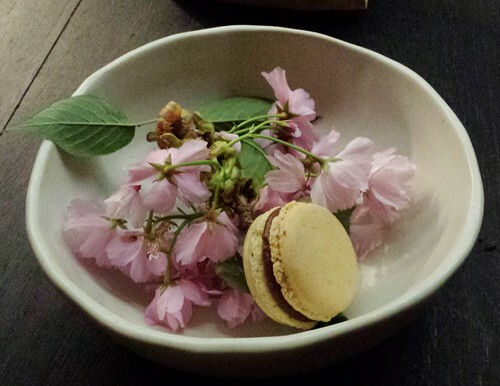 My dinner concluded with a chamomile chocolate macaron presented on a bed of pink blossoms. Although the flowers were not edible, they certainly sent me off with dreams of spring. I can’t wait until spring arrives in my neck of the woods too!